With deep intakes of breath, the children excitedly peered into a box lid. "Oh, it's one. Oh. Oh," they said. The scared hedgehog ducked, curling itself into a ball with its quills pointing outward. Then he slowly lifted his nose to sniff the box's edge. "See his little nose," became the children's cry. His visit was part of an effort to excite Meadows Elementary School second graders about reading. Indiana State University's Reading Resort brings together 10 ISU students with about 20 second graders on Tuesday and Thursday after school. They read books together and play games as the university students help get the elementary students excited about reading. During each Reading Resort there is an activity portion when the children read a book together and create crafts to reinforce their reading. 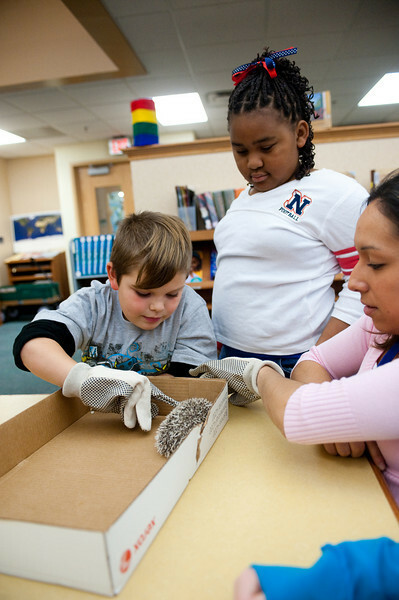 Jennifer Perez, the program's site manager, has read Ragnhild Scamell's book "Apple Trouble," which is about a hedgehog that gets an apple stuck to its back, to the children during the activities segment. They've created their own hedgehogs with apples stuck on their back. But, Perez wanted to make the hedgehog real for the children and borrowed one from a pet store. "More than anything it makes them want to read," said Perez, a junior elementary education major from Hobart, about the activities. "The next time we'll get on computers and they'll look up information on hedgehogs. It makes them excited. They want to learn about hedgehogs." Many of the elementary students said they enjoyed seeing and touching the hedgehog. "I got to touch his spikes, but it didn't hurt because I was wearing gloves," said Darryl Cooley. "I thought it would be bigger," said Adara Grady as she spread her arms to show the size of a medium dog. 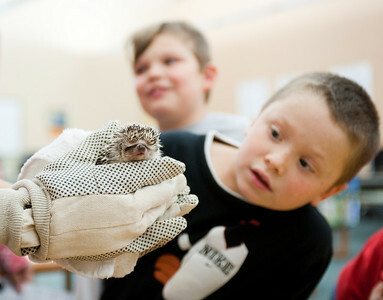 "They go up when you touch it," Dylan Corby said about liking the hedgehog's quills. R obbie Owen said the hedgehog's visit is his favorite part of attending Reading Resort. "It looked cute," he said, as he wrinkled his nose and sniffed liked the hedgehog. "I liked how its spines looked white and black." Grady said she likes to attend the program because of the reading. "You get to read a lot," she said. "You get to learn from reading. I like to learn." Keaera Blakely said she also enjoyed learning through reading. "There are interesting stories. It's funny. It makes you sad sometimes," she said about books. "It gives you words to learn that you never ever knew. Then you can practice them and then you'll know them your whole life." Reading helps Corby to get good grades, he said. "It's important to get higher grades and you get better and better at it," he said about reading. James Young, media specialist at Meadows, said school officials appreciate the university students working with the elementary students. "Second grade is a crucial time," he said. "They develop a lot of basics with reading at that time. This helps them through that hurdle. I have witnessed the kids' reading levels go up." Indiana State University's Reading Resort brings together 10 ISU students with about 20 second graders on Tuesday and Thursday after school.